Stanley Ardell McCollough, 93, of Renfrew, formerly of Chicora, a 33rd Degree Free Mason, a combat veteran of WWII and Korea, and a life member of the Chicora Volunteer Fire Department passed away Saturday morning, March 16, 2019, in the comfort of his home. Stanley was born in Chicora on January 10, 1926. He was the son of Oliver M. and Elizabeth H. Garing McCollough. He was a 1944 graduate of Fairview Twp. Karns City High School, and was employed for many years at ARMCO Steel in Butler, and retired in 1989 as a General Project Supervisor. Stan was a life member of Holy Trinity Lutheran Church in Chicora. He was a Staff Sergeant in the United States Army Air Force serving in both WWII and Korea. He was a Nose Gunner on the B-24, and was in Japan on VJ Day. He was a member of Argyle Lodge #540 F&AM, where he was a past master and a charter member of the Chicora Masonic Building Association, the Consistory Valley of New Castle, past Sovereign Prince, and was elected to receive his 33rd Degree in Free Masonry in 1986. 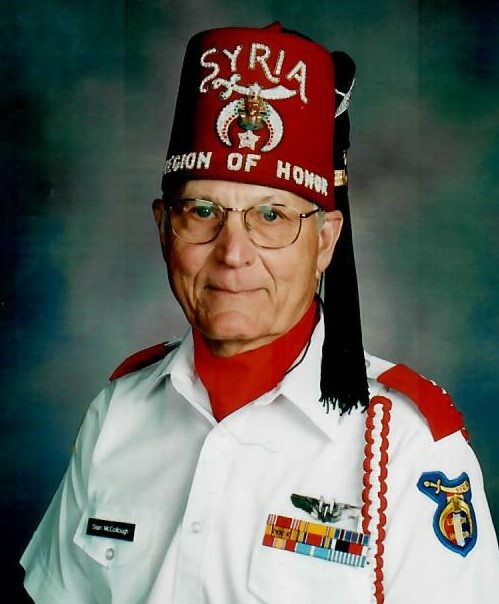 He was a life member of the Butler Royal Arch Chapter Council Commandery, and the Syria Shrine. He was also a member of the Butler Luncheon Club, the Royal Order of Scotland Antioch Conclave, and the Red Cross of Constantine Board of Governors 32. He was an Ambassador aide to the Potentate, Commander of the Legion of Honor, and Past President of Deputy Unity and Caravan #14. He was a member of the Masonic Learning Center for Children, and a Past Patron in Butler Chapter #45 of the Order of the Eastern Star. Stan was a life member of the Butler Elks Lodge #170, a member of the Aricadia Moose Lodge #1327, a life member of the Chicora Volunteer Fire Department with over 63 years of service, and the Former Chicora VFW Post. He was preceded in death by his wife, Patricia A. Craig McCollough, whom he married in Oil City on July 19, 1949. Mrs. McCollough passed away on September 23, 2018. Stanley is survived by his brother-in-law and sister-in-law, Eugene “Pud” and Shirley Craig of Chicora, a number of nieces and nephews, great-nieces and great-nephews, as well as his caretakers, friends and neighbors. In addition to his parents and wife, he is preceded in death by six brothers, and two sisters. Friends will be received at the Hile Funeral Home of Chicora, 339 Chicora-Fenelton Rd., Chicora, from 1-3 and 6-9 p.m. today (Monday), and on Tuesday at the Holy Trinity Lutheran Church, Chicora, from 10 a.m. until 11:45 a.m. A funeral service will follow from the church at 12 noon, with church pastor, Rev. Joseph Boomhower, officiating. Military honors will be accorded at the church by members of the Chicora, East Brady, and Brady’s Bend American Legion Posts. Members of the Chicora Fire Department will conduct a memorial service for their departed brother at 6 p.m. Monday at the Funeral Home. Members of Argyle Lodge #540 F&AM will conduct a memorial service for their departed brother at 8:45 p.m. Monday at the funeral home. Members of Butler Chapter #45 Order of the Eastern Star will conduct a memorial service at 9 p.m. Monday at the funeral home. For more information or to send a condolence, please visit www.hilefh.com.